I've seen many people ask how they can get certain types of ingredients. Whether it be getting eggs, asparagus, broccoli, etc. there is a solution to getting the ingredients that you need. The best part is with this tip you can harvest ingredients without having to unlock new areas! Step #1. Become ChefVille Friends With High Level Players- Players that have a higher level than you will likely have more areas unlocked, which means that they will have access to a great variety of ingredients. Step #2. Visit These Friends- You can simply click their picture at the bottom of your screen and you will be taken to their restaurant. Step #3. 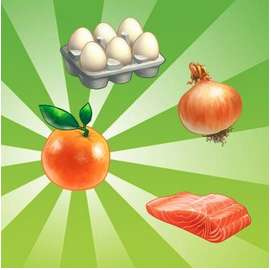 Collect Ingredients!- Once you are in your friend's restaurant, click on the ingredient that you want to harvest. Finding most ingredients is pretty straightforward, (Eg. Click the Chicken Coop if you want Eggs, Click the Pond if you want Salmon). The only catch is that you can only do this 5 times per friend every 24 hours. I hope these tips helped. If there are any other ways of getting ingredients please comment below. Thanks for reading!